At Overfly Tenerife, we bear in mind that a lifetime holiday is composed of several factors depending on your tastes. Nevertheless, there is an undeniable common point of interest for every tourist and every human being— food. Although you don’t consider yourself a foodie, it doesn’t mean that you don’t care about good food. That is the reason why we have created the list that you will find bellow with the best restaurants in Costa Adeje. Our insatiable appetite has driven us to try almost every restaurant in Costa Adeje, and we dare say that some of them are not just the best restaurants in Costa Adeje, but the best restaurants in the whole Tenerife. When it comes to restaurants, Tenerife Island has a wide enviable variety. You will find from Canarian cuisine to traditional British cuisine or Japanese sushi — definitely, all the best for great tastes and imaginative menus for those who get bored easily. Therefore, whatever makes your mouth water, loosen your belt and dare to enjoy a meal to remember at one of the best restaurants in Costa Adeje. Take a look at the ones that we recommend you on our Costa Adeje Restaurants Guide! 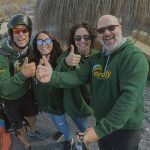 Apart from paragliding in Tenerife South and other marvellous activities that you can do in this part of the island, eating is one of the best things to do in Costa Adeje. Check our list down below and decide which one is the best restaurant in Costa Adeje for you! El Patio Restaurant has been in the best restaurants in Costa Adeje and in the whole Tenerife for a long time now. It is a multi-award winning restaurant due to its excellent quality and its amazing staff. Moreover, if you want to enjoy all the elegance, beauty and charm of Andalusia, it is brought to you in a palm-shaded patio together with fancy water features in this restaurant. If you want to celebrate and special occasion or simply a special night, it will definitely be a success in El Patio Restaurant. Imagine amazingly beautiful tablecloths, the most shining silverware, and an incredibly professional service of a standard seldom seen on the whole island. Here, you will find succulent and glamorous starters such as Terrine of Foie Gras with Stewed Figs from El Hierro or Fresh Gnocchi of Black Potato and Ricotta with Summer Mushrooms. All of them are based on seasonal flavours merging Mediterranean culinary specialities with a local spin. Let’s move on the main courses! They are as magnificent as the starters, and they are also delightfully presented and fascinating in taste. On the one hand, if you like seafood, we strongly recommend you to try the Lobster with Coral Sauce and Yuzu Mayonnaise. On the other hand, if you are a meat lover, we recommend you trying the Roast Shoulder of Lamb with Creamy Garlic, a Tabule of Vegetables and Pepper Sauce. But if you love to see how food is prepared, you can also do it here! There are two main courses which can be prepared at your table! If you are curious about this, try the Steak Tartar and Pepper Sirloin — they are famous in the whole island! Now, it is time to enjoy the desserts! It is not easy to find a creative choice of sweet treats to end the perfect menu. It must be a dessert that provides the most exquisite pleasure, but… how can you choose among all those delights? Well, you can leave the decision making to the chef by choosing the wonderfully delicious Tasting Menu. It will make you experiment a lush culinary journey through the very best repertoire of El Patio restaurant. As we have said before, this is one of the best restaurants in Costa Adeje, so it is definitely a great option for those people who appreciate the most excellent things in life and who enjoy dining out in intimate but elegant surroundings with an exquisite staff. Furthermore, if you are a wine lover, you should know that the range of top international labels will definitely amaze you. There are more than 100 wines on offer from its cellar. Are you still wondering if it is one of the best restaurants in Costa Adeje? The BB Restaurant is one of the best restaurants in Costa Adeje. It is located in the famous Baobab Suites in the upscale area Playa del Duque (Costa Adeje), and it welcomes all their public with their arms wide open! The staff of the BB Restaurant is amazing, and they have a great philosophy — ‘Your Holiday, Your Way, Our World.’ It is undoubtedly one of the best restaurants in Playa del Duque. There are a lot of things that make this restaurant special. First of all, the astonishing views. You may think that we are exaggerating about how stunning the views are, but you will believe us for sure when you witness them on by yourself. Apart from the views, once you come into the BB restaurant, you will smell the captivating aromas emerging from the kitchen, but that is just what you will feel just before you experience the most delightful sensation of all — the delicious taste of the food. As we have mentioned before, their staff will make you feel as you were part of the royal family, and their products are so impressive that they will make you have the same feeling. Their incomparable menu includes the most popular international dishes from typical British recipes, to Japanese sushi, to the most delicious local Canarian delicacies. Come and enjoy them all at one of the best restaurants in Costa Adeje! La Farola Del Mar is one of the endless restaurants and cafes along Playa de Fañabe, in Tenerife south. This cosy restaurant is another of the best restaurants in Costa Adeje. It was first open in 1999, and it is on the second row up from the beach — so that it provides a stunning view from a higher vantage point. They serve lunch and dinner, as well as coffee and cakes if that takes your fancy. Plus, they serve another delicious spirit drinks and cocktails! They offer their clients the best national and international cuisine, taking care of every detail. They use local ingredients to make their meals and their unique desserts… al of them irresistible! Furthermore, during most of the mealtimes — mainly lunch and dinner — there is excellent live music provided by pianist playing a keyboard piano. Their only aim is to satisfy all their clients during their holidays and to meet all their expectations. There are plenty of good restaurants which claim to celebrate a culinary fest with their servings. All the food they serve is claimed to be a delight for their clients’ palate in sumptuous surroundings. If we talk about La Cupula Restaurant, the term ‘culinary fest’ doesn’t come close to doing it justice. It is undoubtedly one of the best restaurants in the whole Costa Adeje. We invite you to enter through its impressive facade and make your way to this luxurious and extensive restaurant. Once you are seated there, you will notice a marvellous ambiance full of peace and tranquillity. La Cupula — which means “the Dome” in English — is a restaurant which believes in providing a breathing space for their clients in order to allow them to enjoy and be relaxed. The subtle lighting of La Cupula Restaurant is embellished by its impressive arched windows coloured with stained glass. They create an amazing kaleidoscope of beautiful colours which is constantly changing as the sun moves across the sky. Astonishing! Moreover, if you are looking for a place to dining in Tenerife where you can have dinner al fresco on a stunning terrace, La Cupula is exactly what you are looking for! Its terrace combines perfectly that country house feeling with the tropical touch of palm trees and lovely flowers. Another reason why it is the one of the best restaurants in Costa Adeje! Now it is time to talk about food! At a basic level, the bill of fare could be described as a fusion of Canarian and French cuisine. Nevertheless, the dishes created from this singular combination are far from what we consider “basic”! If you want to live a complete culinary experience here, you can choose the Chef’s Menu. It consists of 6 different courses — two starters, a fish course, a meat course and two delicious desserts. But no meal would be complete without a good wine. We strongly recommend you make your dining choice and then ask the head waiter to choose which bottle would be the best to complement your meal. La Cupula is probably the best restaurant in Costa Adeje if you are looking for a romantic meal with your couple, a meeting with your close friends, or even a ‘party’ celebration with your family. If you want the best quality, La Cupula is your place. Definitely, this restaurant located in the five stars Hotel Jardines Navaria , situated in the incomparable area of Playa de Fañabe, is undoubtedly one of the best restaurants in Costa Adeje. If you want to have dinner in a peaceful haven while you overlook a roof top swimming pool in a 5 stars hotel, La Laja Restaurant gives you the chance to live all of that! It is located very close to Playa del Duque too, and it is definitely one of the best restaurants in Costa Adeje. La Laja’s menu is a modern fusion of Mediterranean styles. It combines the traditional cuisine with the new one in an absolutely sublime ambiance. The large panelled windows of this restaurant will allow you to enjoy the views of the changing colours of the sky as the sun gives way to the stars. Drawing on Spanish, French and Italian influences, you will find fascinating options on the menu such as the cod ravioli or the pork sirloin flambé. They are amazingly great! Don’t you want to try one of the best restaurants in Costa Adeje? Ten O’Clock is a restaurant located at the lower end of Costa Adeje, towards Playa de Las Americas. It is one of those little places with a cosy ambiance and tables with a stunning view of the sea. The staff here is amazing and extremely fast, because they seem to be everywhere at once! The food here is incredibly tasty, plentiful and, what’s more, cheap! If you add that the views are wonderful, we could say that it is undoubtedly one of the best restaurants in Costa Adeje! All their dishes are wonderful, but we strongly recommend trying their special sandwich —although their hamburgers are also quite good! In terms of drinks, the mojito is awesome, so you better try it! Well, cocktails here in general are worth to try! This cosy place is one of the top restaurants located very close to Playa de las Americas, and it serves a wonderful and varied menu. All of this in a rustic and intimate setting right next to the San Eugenio shopping centre. At Mario’s Restaurant, one of the best restaurants in Costa Adeje, you will find a catering for every taste and budget. Its enormous international menu includes a wide variety of food such as Italian pasta, oriental dishes, delicious Spanish and grilled meats, or the classic paella as the house speciality. We have to add the unique friendly service and a location easy-to-find and easy-to-reach. Here you can enjoy a marvellous day with your friends, family or couple. Mario’s Restaurant is a family-friendly place that you will want to visit over and over. This restaurant is very popular among both tourists and locals. So we strongly recommend you to give Mario’s Restaurant a try. It is located right opposite the Bouganville Hotel and on the same street as The Star Bar — one of the best bars in Costa Adeje to enjoy nightlife. Otelo Restaurant is a bit of an enigma in the south of Tenerife. Many years ago, longer than what we can remember, the owner of this restaurant hit upon a simple chicken dish that took the world by storm. He married chicken and garlic with a secret blend of herbs and fried to crispy perfection. This recipe made this place one of the best restaurants in the area of Costa Adeje, and it was lead to be on the culinary map of Tenerife forever. Nowadays, you can find more than five establishments in the same square mile with a similar flavor. So now, the question is — what makes Otelo being one of the best restaurants in Costa Adeje? There are several factors that make this place so special, but one of the key factors is its location. It is situated at the very top of Adeje, on the edge of a vertiginous plunge — the setting is extraordinarily breathtaking. This restaurant is at the top of a very abrupt slope. The interior is somehow exciting, and it is always full of people talking about the food and the scenery. Nevertheless, don’t expect to find a full menu here. There is only one choice at Otelo — chicken! Of course, you can get other dishes but Otelo Restaurant is mainly a chicken restaurant. So, if you don’t like chicken or if you are vegetarian, you better don’t go there. If not, it is a must! Otelo Restaurant is a great option to have lunch — at that time, you will have the chance to appreciate the astonishing views. There is also another Otelo Restaurant (Otelo II) located on the promenade beach in Fañabe. It is run by the same family so its taste chicken is equally delicious, but you won’t get the breathtaking views! The crisp garlic chicken recipe is a carefully kept secret. It is just known by the Otelo’s family members and its clandestine kitchen staff. Don’t you want to try this mysterious chicken of one of the best restaurants in Costa Adeje? We hope that you have enjoyed this post and that we have helped you out finding the best restaurants in Costa Adeje. Remember that we will be here waiting for you to practice the best tandem paragliding flight of your life, but we want you to be well-nourished to enjoy the flight as much as possible! If you have any doubt or you need more information, don’t hesitate to contact us. We hope to see you soon in Costa Adeje!